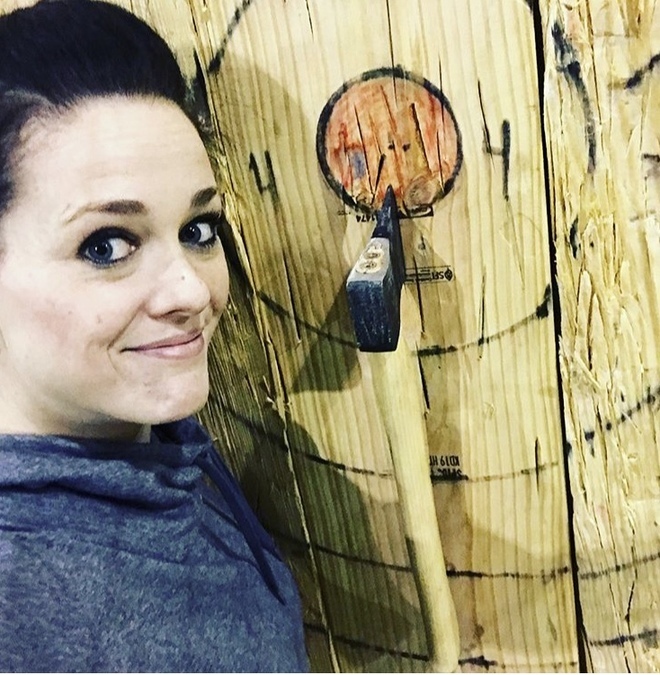 Fit and Fun: Get some aggression out and work your lower back with ax throwing! Welcome to Fit and Fun! WCPO editors Max Alter and Meghan Wesley love to work out. But, like anyone else, they get bored with the traditional gym workout. So they decided to start #fitandfun, an Instagram series where they will try different workouts throughout the area and take you along for the ride. They'll tell you the basics and give each workout a fun rating out of 10 every two weeks on Instagram. Follow along at @9OnYourSide and with the hashtag #fitandfun. Last time, we Vibe Dance Fitness in Newport. The first suggestion I received when I started Fit and Fun was ax throwing. It took us a little while to fit it in, but man am I glad we did. This is not billed as a workout, but Travis Smith, the general manager, told us that if you aren't feeling it in your lower back when you leave, you didn't do it right. 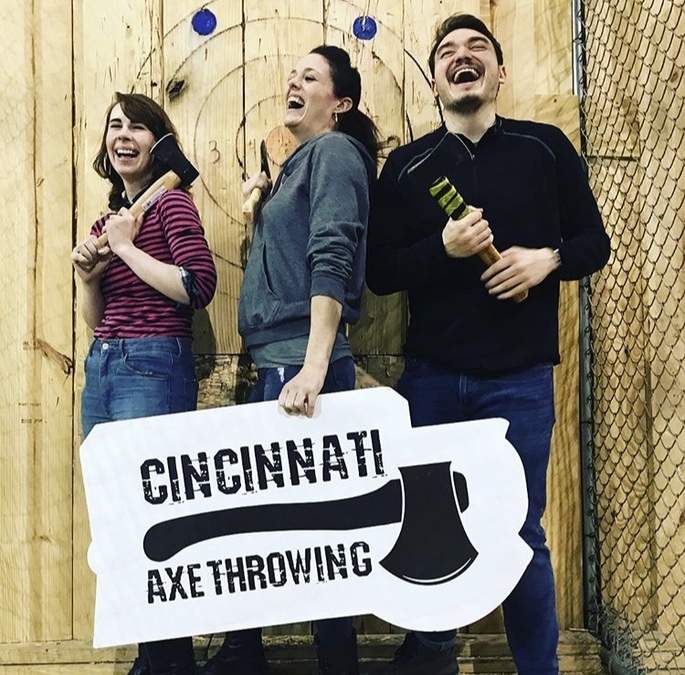 Cincinnati Ax Throwing is located in West Chester. They also have a couple of sweet escape rooms (one has a zombie that chases you around, so you might be able to get away with calling that one a workout, too!). Before we went, I thought we'd be hurling axes one-handed. This is proper ax-throwing form. Turns out there's quite the strategy to it: Take the ax in both hands with your thumbs meeting in the middle, almost like you're swinging a golf club. Then you extend the ax behind your head, bend backward, thrust your body forward, let go of the ax and finish with your arms extended behind you. It took me a few tries to get it right, but once I did, I hit the target almost every time (I even got a bull's-eye once!). I got a bull's-eye. I had to take a selfie with it. Obviously. Most evenings and weekends are open -- you can go to their website to find a date and time and book your session. You can also book parties or corporate events (I'm totally having my birthday party there this year. It's also BYOB!). It's $28 per person if you choose a pre-scheduled public ax throwing. Private parties of six or more cost $20 apiece and need to be paid ahead of time. They're offering a special Valentine's Day discount of $8 by using the discount code "AXELOVE" when booking a session. Dude. You've got to try this. While it wasn't as much of a workout as most of the Fit and Funs we do (again -- it's not billed as a workout! ), I certainly felt it in my back, shoulders and arms the next day. But man did we have a great time. I can't even say in words what a great time we had. Once you get the hang of throwing the ax, you don't want to put it down! And the people teaching the classes are seriously fun. We give it a 10/10 on the fun scale. Know of any workouts we should try? Email Meghan at meghan.wesley@wcpo.com . Or use the hashtag #fitandfun and tag @9onyourside if you try one! Meghan and Max are back (we brought web editor Sarah Walsh with us!) with the latest #fitandfun, where we go all around the Tri-State to find workouts that are unique and, most importantly, fun! So get out of your boring gym routine and check out some different workouts in the area with us! 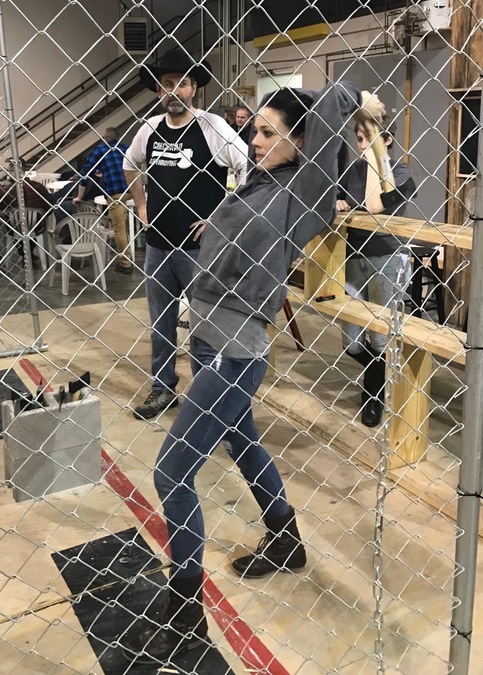 This week: Axe throwing at @cincinnati_axe! This is not billed as a workout, but Travis Smith, the general manager, told us that if you aren't feeling it in your lower back when you leave, you didn't do it right. How it works Cincinnati Axe Throwing is located in West Chester. Turns out there's quite the strategy to it: Take the axe in both hands with your thumbs meeting in the middle, almost like you're swinging a golf club. Then you extend the axe behind your head, bend backward, and thrust your body forward, let go of the axe and finish with your arms extended behind you. It took me a few tries to get it right, but once I did, I hit the target almost every time (I even got a bullseye once!). When can I try? Most evenings and weekends are open -- you can go to cincinnatiaxe.com to find a date and time and book your session. You can also book parties or corporate events. What's the cost? It's $28 per person if you choose a pre-scheduled public axe throwing. Private parties of six or more cost $20 apiece and need to be paid ahead of time. Was it fun? Dude. You've got to try this. While it wasn't as much of a workout as most of the Fit and Funs we do (again -- it's not billed as a workout! ), I certainly felt it in my back, shoulders and arms the next day. But man did we have a great time. We give it a 10/10 on the fun scale. Give us ideas! Know of any workouts we should try? Email Meghan at meghan.wesley@wcpo.com. Or use the hashtag #fitandfun and tag @9onyourside if you try one!